Match Highlights Real and Barcelona at the Santiago Bernabeu played an incredible El Clasico derby match that eventually ended with a later 3:2 for Barcelona thanks to Lionel Messi’s last seconds goal. It was a game without a lot of play in defense, with a lot of twists and turns, great moves and with an awful lot of excitement. The impression that it would be only fair that the El Clasico ended with a draw, but with this did not agree miraculous Argentinian who his second goal tonight scored in the last seconds of the match. Before the game, Real Madrid have had all in their hands. One game less played, 3 points gap lead at the top, and the Los Blancos took the lead trough Casemiro in the 28th minute, meaning practically putting one hand on La liga title. But as we get used to, El Clasico is played until the last seconds. The mercurial Argentine Lionel Messi after 5 El Clasico’s in which he failed to score, leveled the score by a great solo action, only five minute later. Until the 73th minute the result was 1-1, but both teams had their chances. The main reason for this result were both goalkeepers who were simply superb this Sunday. Four minutes later, new troubles happen for the Los Blancos, as Sergio Ramos was sent off after a foul on Messi. With an absence of defenders, Real Madrid continued to play with only one defender and two sidebacks. Punishment for that came in the 77th minute when the Croatian midfielder, Ivan Rakitic just outside the box with his left leg bags a stunner. Still, the Los Blancos didn’t give up. They had their chances, but Marc-André ter Stegen saved all. In the 82nd minute Zidane sends Benzema out, and James Rodríguez in. This move payed off for the French coach as only three minutes later on Marcelo’s assist, James leveled the score. When it looked like the El Clasico will end with a fair draw, Sergi Roberto makes an important run, sends the ball to the left flank, and Jordi Alba makes a cross which Lionel Messi converts into the last seconds goal winner. It was Messi’s 15th league goal in meetings between Spain’s big two at Santiago Bernabeu on Sunday, meaning he’s now the all-time top-scorer after surpassing Real Madrid legend, Alfredo Di Stefano (14). Situation at the top changed. 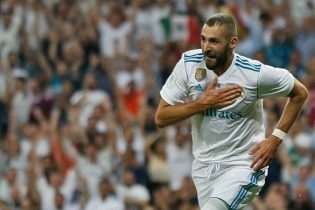 Real Madrid and Barcelona are now align with the Catalans side reclaiming top position, but the Los Blancos have played a game less and much can change until the end of the season in which six rounds remain to be played.